Stuff Points: Earn 67 points when you buy this stuff. A large bowl, normally reserved for floor models, sits atop a scrolling metal stand. This combination of parts makes for an elegant looking fountain that would be perfect for any home or office location. 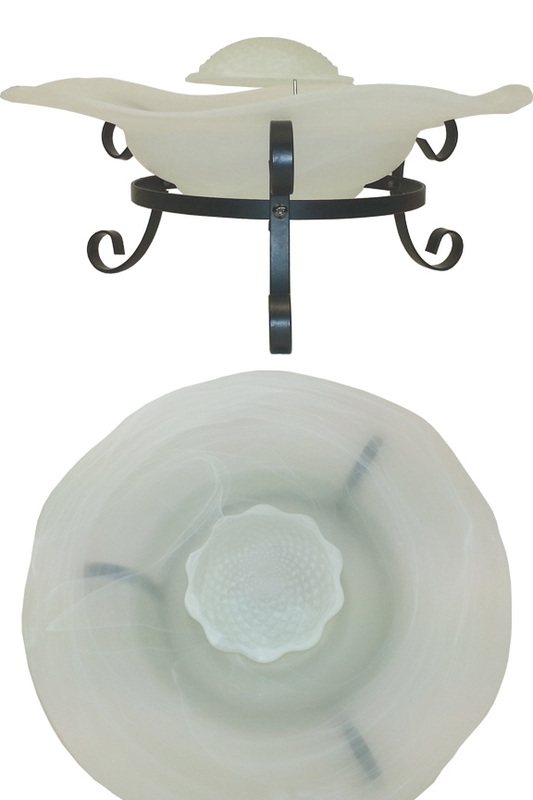 It is a large sized table top fountain, and features a thick glass bowl with a 16" diameter. This means that it can hold more water compared to most other table models, so you will be able to run it for longer periods between fill ups. The Petal Mist Table features a high quality mister with 12 color changing LED lights that will cycle through 16 different lighting modes when the unit is running. The LEDs illuminate the cloud of mist and the bowl, causing them to change colors as it runs. When this fountain is turned on, it is an amazing looking decoration that will add intrigue to any space. It also acts as a natural humidifier, air purifier, and fragrance diffuser, so it is much more than a great looking water feature. Soothing water noises will also accompany the mist production and light show to enhance your space and relax your mind. A three legged metal stand will support a large floral styled bowl in your choice of colors. The thick, high quality glass that the bowl is made from is semi-translucent, so each color will be slightly see through. This allows for the LED light to shine through the marbled color of the bowl, and it will appear to change colors as the lights on the mister change. It is a stylish fountain, making it perfect for many applications like your living room, office, or even in a child's room as fun looking humidifier. Once you turn it on, a natural cloud of mist will form on the surface of the water. It will completely fill the bowl, and then gently spill over the edge, and float away. It comes equipped with an auto changing mister, which means that it will change colors automatically. 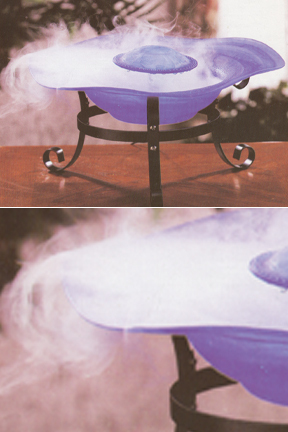 As with all our misting fountain models, all you need is water to create an amazing cloud of mist. Just add water to the bowl, plug it in, and relax while the soothing sounds of water, a mesmerizing light show, and a billowing cloud of foggy mist take your troubles away. What Is The Mist Made Of?? Pure water vapor. When the ceramic disc in the misting unit vibrates, it makes the mist, which is nothing more than a cloud of vapor. It will also generate negative ions along with the mist, and these will help to purify the air in your home or office. There are no chemicals or dry ice involved. Just simple tap water is all you need to enjoy the benefits of this unique misting fountain. A ring of 12 LED lights rotate colors to illuminate the bowl and intensify the look of the mist. With such a colorful light show, it can almost be considered a lamp. Whatever you call it though, this is one colorful and unique decoration for your home or office. It not only looks good, but it is also beneficial to your health and well being too. Because it is a natural humidifier, air purifier and fragrance diffuser in one, it will add humidity to the air, clean it of contaminants, and you also have the option of adding fragrance to the air with the use of essential oils in the bowl of water. The moisture created can help people with allergies or respiratory problems, feed plants, add moisture to your skin and more. Includes a misting making device with color rotating LED lights. Complete with frosted glass bowl and high quality metal stand. This tabletop model is the perfect size to put almost anywhere. Order Yours Today! Had this years ago and used it everyday. gave our spare one away and went back to mall to get another and the kiosk was gone.. has been years to find it again.. We LOVE it. Humidifies, and add a few drops and the whole house smells wonderful. Have animals and elderly and it covers all the odors and stale house smells beautifully, especially in the Florida hot weather, when windows closed and air conditioner on. love the relaxing changing colors. It gets 10 stars!! My order was shipped timely and packed well. Customer service very responsive and quick. I would highly recommend this company. I really like the mister, but do not use the stand because it would not fit my plant stand. Beautiful. well packed. nice size. nice rotating colors. If only it had an off switch as opposed to having to pull the plug out each time. Great company to deal with. Prompt shipment. I ordered this item for a Christmas Present. I received it on time, but, the bowl had two holes in the bottom instead of one. The fountain was unusable. I contacted simplygoodstuff and they immediately started working on the problem and sent me another bowl. I received it on Jan 16, 2013. Although there was a problem, they took care of it and seemed happy to do so. Their service was OUTSTANDING. Very nice company to do business with. If I want the bowl to change colors do I have to choose the "color" as my option or does the "white" change color as well or stay white? The LED lights inside the bowl are what change colors, so all bowls will appear to change. In fact, white will give some of the best color changing effects when compared to others due to the lack of pigment in the actual glass. i have a tabletop fountain it stays on one color how do u get the lights to rotate? Some models will come with misters that only have one color bulb. These can not be altered. Others will have controllable lights. An inline set of controls should allow you to adjust the mode, and switch between several different color combinations. The third type will have multiple colors, but it will rotate by itself. You do not have this kind unless two of the colors have burnt out. For the fountain colors it list black. Is the glass really black or a dark blue? Because the bowl is semi-translucent, it ends up looking like a smoky gray. Definitely not blue though. Besides mist, there are 12 LED lights that change colors in different patterns. The colorful lights will shine brightly to illuminate the water and bowl, and make them look like they're changing colors too. There were no instructions or paperwork of any kind with the one I ordered. I need instructions on how it is supposed to be set up please? Sorry to hear that. Did you order from us? All models should come with instructions, but give us a call if you need someone to walk you through the process. Yes. Detailed instructions should be included. How do I go about ordering the fountain that produce the highest fog amount? That's what I think is the prettiest aspect I of the fountains. Most fountains will come with a 16mm mister from the factory. For maximum fog, you'll want to replace the basic mister with a 20mm replacement model. Can I just replace or purchase just the adapter? We don't sell the AC adapter alone, but you can get a replacement mister set that includes a new misting device along with the AC adapter. Can I get this in white rather than blue??? Color options will vary based upon what's currently available and in stock. We do have white as a color option when possible, but the product options above will change based on inventory availability. Are these still available and in what color glass? Thanks! Yes. As of today, this model is still available. For current color options please check the selection above, and for the availability of any color not currently available please call or email for more details.